Subscribe to Redd Wood's quarterly newsletter. A native of New York, Richard Reddington has made an indelible mark on the West Coast dining landscape. Reddington has been honored with multiple nominations for the James Beard Award for Best Chef in the Pacific Region. Redd Wood is a casual, Napa-style pizzeria, located on the north end of Yountville, in the heart of Napa Valley. Reddington's restaurants reflect the dedication of a chef who, after spending more than 15 years in some of the best kitchens in the United States and Europe, has found the perfect balance of serious food and unpretentious environment. 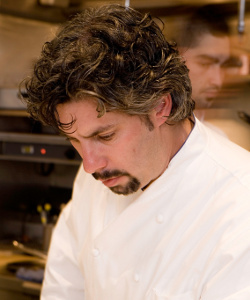 He began his career working for Roland Passot at San Francisco's renowned La Folie in 1990, later moving to Postrio before heading east to David Burke's Park Avenue Café in New York City. A stint at Rubicon in San Francisco was followed by a French sojourn at the Michelin three-star Arpege and Le Moulin de Mougins with Roger Vergé, a prelude to working with Daniel Boulud at Restaurant Daniel in New York. Returning to California, he helped open Spago Beverly Hills as Sous Chef, before taking the Chef reins at Jardinière in San Francisco and then Chapeau, where he was named ‘Rising Star’ by The San Francisco Chronicle’s Michael Bauer. In 2000, he was drawn north to Napa Valley and began a four-year tenure as Executive Chef at the landmark Auberge du Soleil. There, he captured attention when he was voted ‘Best Rising Chef’ by San Francisco Magazine. After leaving Auberge in 2004, he took the reins at Masa’s in San Francisco, before taking the leap to launch his eponymous restaurant.